Three cheers for the stage veterans this month where Soulpepper Theatre let’s the best of the best strut their stuff in Caryl Churchill’s curious and bizarre Escaped Alone. No matter what angle you choose to look at it, some things are forever English. Tea and crumpets, Buckingham Palace, tennis, and a pints of lager at the friendly local pub. 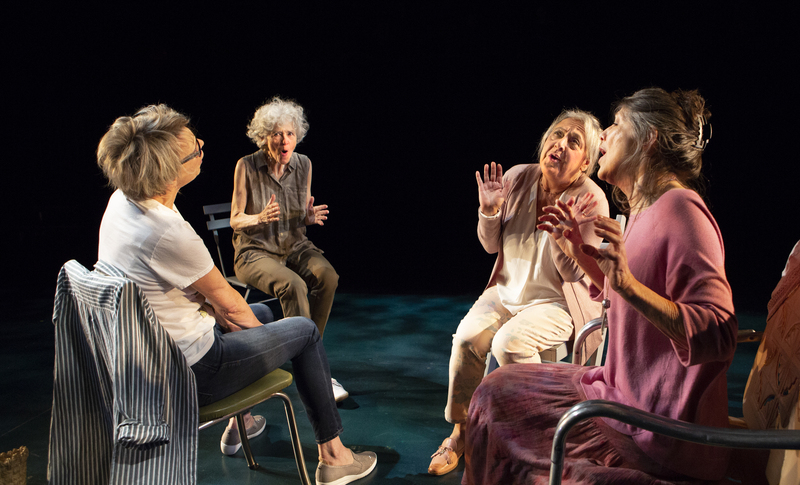 Caryl Churchill’s something-freaky-this-way-comes—Escaped Alone—a delightful drama detailing the end of the world, certainly does buck this identifiable trend. And for very good reason. While theatre traditionally invests in ramp-up scenes setting up its deliverable, this short and punchy four hander gets right down to the point risking zero harm to anyone’s attention span. It’s super dim but not scarily dark. Semi-twisted but not remotely deranged. Pleasant exchange of pleasantries veer off to the horrors of the new normal and you’re really not sure which segment the playwright desires to pull you into more so than the other. There are so many ways to play this story out yet, despite this, director Jennifer Tarver smartly decides to resist the path of strange in this vision and opts to 4 chairs in a suburban garden with no spooky atmosphere whatsoever to bolster the bizarre. Or instead, seizes the opportunity to let Brenda Robins, Kyra Harper, and Maria Vacratsis to do so in their mundane meanderings of the good ol’ days. When it comes time for the lights to go low and a spotlight to show the perpetually marvelous Clare Coulter specify the nightmare that beseeches them, you get an eerie sense that the apocalyptic future is just a few steps away for all of us. This one isn’t a fun night at the theatre or even fabulous one. Let it be said succulently stirring is equally irresistible just the same.